Here I sit browsing the June/July issue of The Appalachian Voice and came across an interview with two folks from the OGS. In it there is a recipe for garlic soap spray, supposedly the executive director’s favorite. One of the ingredients is mineral oil. The Internet defines mineral oil as “a liquid by-product of the distillation of petroleum to produce gasoline and other petroleum-based products from crude oil.” How is that organic? I know that some folks think this stuff is the best thing to use on their wood and metal kitchenware. I think the idea of eating petroleum sounds disgusting and potentially hazardous. What do you think? This is an excellent question, and not one with an easy answer. You are correct that mineral oils, which are components of horticultural oils, are byproducts of petroleum processing. As coffee-stirrers are to the lumber industry, so are mineral oils to the petroleum industry. They are colorless, odorless oils that remain after refinement of crude oil, so are produced in huge quantities, and carry a relatively low value. As a result, the market for mineral oil has been obviously bolstered by an industry interested in maximizing a waste stream to the fullest extent. Aha! This kind of thing is a kingdom for my enthusiastic skepticism. Let’s dig a little bit deeper, shall we? Petroleum-based oils have been used in agriculture since the beginning of the industrial era, mostly in the form of “dormant oils” then, which are extremely viscous, relatively un-refined mineral oils used on woody plants. “Horticultural oil” or “Hort Oil” is an umbrella term used to describe mixtures of a mineral oil and a detergent, for use on plants to deter pest insects, molds, and mildews. What differentiates the various horticultural oils has to do with the amount of detergent used in combination with the oil, any additional ingredients (such as those in my DIY garlic soap recipe), and also the degree to which the mineral oil component has undergone refinement. In general, the more refined the oil, the safer it is for use. Things to look for when determining the grade of mineral oil in your hort oil product are ratings for sulfur content, viscosity, and evaporation rate. Sulfur content is expressed as a UR rating (“unsulfonated residue”), and the higher the UR rating, the lower the sulfur content. Since sulfur can be toxic to plants, you want to look for a hort oil with a high UR rating. Most hort oils already have UR ratings in the 90s, anyway, since they are intended for plant uses. Viscosity of oils is measured by the time it takes the oil in question to flow through a test ring. For example, an oil that takes 60 seconds to flow through the test ring is rated a 6E oil. An oil that flows through in 80 seconds is rated a 8E oil. The lighter the oil, the more refined it is. Evaporation rate is closely tied to viscosity. The lighter the oil, the faster it evaporates. Mineral oils are a mix of hydrocarbons, mainly alkanes (paraffins) and alicyclic hydrocarbons (naphthenes). Both of these hydrocarbons have a relatively low toxicity, and have been scientifically proven to show no significant toxicity upon prolonged exposure to their vapors. Now, many people freak out when they hear the word “hydrocarbon,” simply because people who care about this stuff know that hydrocarbons=fuel sources, and thusly must be something we shouldn’t use lightly. This is mostly true, but lots of people don’t realize that hydrocarbons are naturally occurring. Methane is a perfect example. What is freaky about hydrocarbons is their ability to bond to themselves, which can sometimes give you dangerous molecules like benzene. However, simple, straight-chain hydrocarbons (paraffins), like the ones you’ll find in very light hort oils are not susceptible to this self-bonding, or catenation. The presence of aromatic atom rings in hydrocarbon molecules is where toxicity reaches significant levels. The simplest aromatic ring is the benzene ring, and benzene is classified as a known carcinogen. Knowing that aromatic hyrdocarbons only get more complex from there, and that they don’t occur in mineral oils, we can probably leave that topic alone, now. Please don’t confuse paraffins with parabens, either. They are really different. Paraffins are pretty stable and have low to no toxicity. Parabens are a straight no-no. That’s another topic for another time perhaps, along with a deeper look at benzene. Another word that makes people stutter is “naphthene”, which is a hydrocarbon found in some hort oils. Folks are likely to confuse naphthene with naphthalene, aka “mothballs”, which are nasty little solids you should avoid like the plague (read: aromatic hydrocarbon). However, napthene is an “alicyclic hydrocarbon”. Alicyclic means that is is not aromatic. Just because a hort oil contains mineral oil, doesn’t necessarily mean it contains a bunch of naphthene. Some oils are higher in naphthene than others, and the more refined the oil, the tinier the quanitites of any hydrocarbon, anyway. OK, now that your head is full of rings and carbon atoms, lets talk about how hort oils actually work. Basically, they smother insects, or coat leaf surfaces to prevent mold and mildew spores from landing on the leaf. Most pesticides, in contrast, interfere with biochemical processes in the insect’s body. A chemical that can disrupt the body chemistry of an insect can also be harmful to humans. An oil that harms by suffocating the insect is decidedly less harmful to you as a gardener. That said, I probably shouldn’t go into the use of mineral oils in cosmetics and baby products. I’ll just briefly state that it is a BAD IDEA. Judicious use of mineral oil in the garden, meaning light oils applied safely, and during the proper season, pose relatively small risk to you. Light oils will most definitely evaporate before you harvest from the plant, and since the vapors are the concern, here, anyway, if you are worried at all you should be worried about proper application, not residue. This is why mineral oils are approved for organic use, described as “synthetic oils with a boiling point between 415-445 degrees F”. They are classified as considered “narrow range” controls and are allowed with restrictions on leaf surfaces. Know that hort oils can kill beneficial mites, because they are too slow to move out of the way and can be suffocated. The good news is that most beneficial insects fly out of the way when they detect hort oils, and are usually unharmed. If you are super anti, consider subbing neem oil (caution: toxic to honeybees) in your homemade spray, or even castor oil. The resulting concoction will be less effective, but similar in its mechanism. In the case of Neem, we also see how different treatments pose different risks, and you really can’t totally win when you’re trying to encourage nature through organic gardening, while simultaneously trying to control her more unfortunate processes (like plant diseases and insect pests). Look for lighter, more refined oils, and search the labels for UR ratings, and viscosity grades. Use safety gear when spraying hort oils, and use them only as directed. 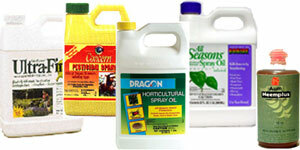 Note that some hort oils are intended for use during plants’ active growth periods (summer, mostly), and others are intended for use during the dormant season. DO be skeptical about mineral oils in body care and especially baby products, and avoid them. Consider creating your own oil-soap combinations, and try subbing in different, naturally occurring oils like neem or castor. Record your results for future use. Meredith Leigh is a die-hard advocate for good food. As a farmer, founder of a butcher shop/restaurant, and writer, she has worked on many angles of real food for over a decade. She currently teaches farming and cooking classes, consults for food and agriculture non-profits, and is writing a book about meat. Meredith has been the Program Coordinator for the Organic Growers School (OGS) Spring Conference since 2006 and was the Director and then the Executive Director of OGS for 10 years.